A Blog Of Ice Cream: Ice Cream Parlors - Creme De La Creme! If you are out and about and really fancy some ice cream, what do you do? Some people might head for the nearest store and buy a tub of B&J's or Haagen-Daz. Speaking for myself I would have to be desperate to do that! Nope, I would look for the nearest ice cream parlor. I'd Google it on my iphone or ask a local passer-by for a recommendation. This is something I've done a lot over the years. What's more I regularly ask friends to let me know if they discover a great ice cream parlor and send me a photo. The end result is that not only do I, my family and my friends get to experience great ice cream parlor 'finds' but you also get to share in them - like today! Above is a seaside ice cream parlor in France. Designed specifically to attract families, the parlor chose to invest in some wonderful ice cream themed furniture and display items. 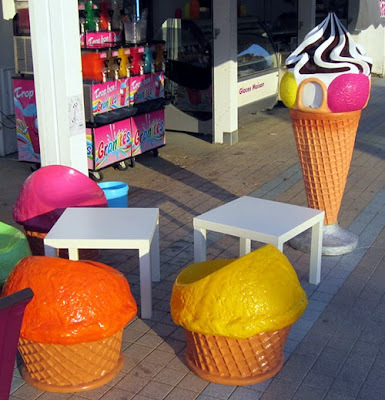 The specially made ice cream cone chairs are brilliant! The big ice cream cone is a clever idea too - not only is it a trash can that entices kids to use it but it enables them to see the parlor from way down the other end of the street! Above is a parlor that takes a different approach. Again in france, this is a village bakery and coffee shop which also makes its own ice cream. 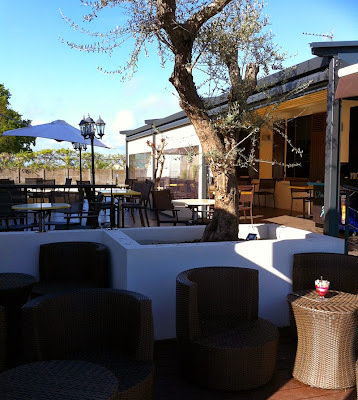 It has a lovely sense of relaxed style with its beautiful small olive tree featured on the decked terrace. So different to the one above but so appropriate in its context. 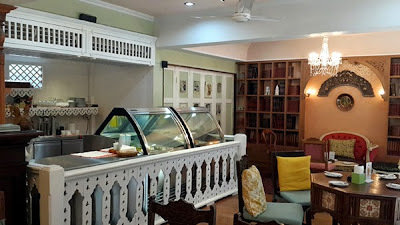 I've eaten at both these parlors and the ice cream was equally delicious but the latter made a bigger feature of ice cream sundaes with sugared whipped cream and homemade cookies stuck on top! So it gets my family's vote :) Read more about French ice cream here. At the other extreme, this next ice cream parlor (below) is not one I've eaten at but it's where my friend Ann loves to take a break in the heat of the day sometimes after shopping. It is in Thailand and is called Dhara Dhevi. Its Thai decor and refined style make this a haven of peace for those in need of a cooling but delicious refreshment and apparently the quality of the ice cream they serve lives up to all expectations.